I dealt with pent-up frustration during the workday by engaging in secular activism on my lunch breaks. Although I didn’t have much experience and my efforts weren’t well-planned, they felt very rewarding. I contacted student groups, made dozens of phone calls, and wrote letters, which is how I ended up with the reply below. In response to a lawsuit filed by Michael Newdow in 2000, the Ninth Circuit ruled in 2002 that “the words ‘under God’ in the Pledge of Allegiance are an endorsement of religion and therefore violate the Establishment Clause of the First Amendment to the United States Constitution.” The Senate reacted by creating S. 292, a resolution “Expressing Support for the Pledge of Allegiance.” Of course, I didn’t like it. 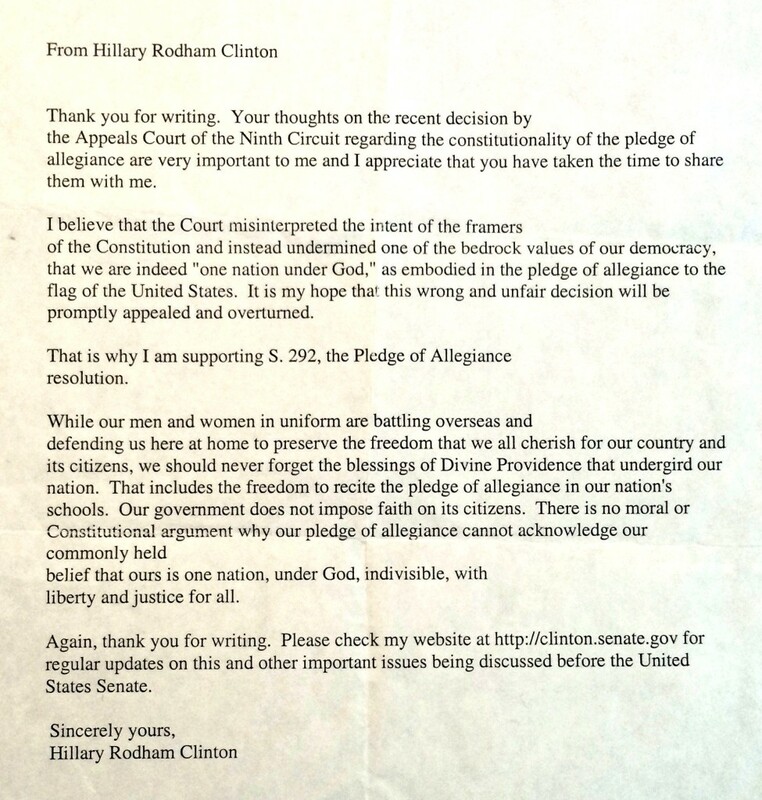 So I whipped off a letter to cosponsor Hillary Rodham Clinton, at that time a Democratic senator from New York. Mr. President, I am surprised and offended by the decision of the Appeals Court of the Ninth Circuit and hope that it will be promptly appealed and overturned. I believe that the Court has misinterpreted the intent of the Framers of the Constitution and has sought to undermine one of the bedrock values of our democracy, that we are indeed “one nation under God,” as embodied in the Pledge of Allegiance to the flag of the United States of America. While our men and women in uniform are battling overseas and defending us here at home to preserve the freedom that we all cherish for our country and its citizens, we should never forget the blessings of Divine Providence that undergird our Nation. That includes the freedom to recite the pledge of allegiance in our Nation’s schools. I can only imagine how they will feel about this decision as they risk their lives for our values. And the children of America, who share a bond with each other and with our Nation by reciting the pledge each day, what effect will a decision like this have on them? It will cause them to wonder about the ways in which our beliefs can be stretched, our heritage can be assaulted. It is the wrong decision, and it is an unfair decision, especially unfair to those who defend our Nation, and to the young people who will inherit our Nation’s future. Ours is a Nation founded by people of faith. People of faith have helped lead some of the most significant movements of social justice throughout our history: to end slavery, to win civil rights for all Americans. No one is required to have faith, and our Government does not impose faith on its citizens. But ours is the most faith-filled nation on Earth, and there is no moral or constitutional argument why our Pledge of Allegiance cannot acknowledge our commonly held belief that ours is one nation, under God, indivisible, with liberty and justice for all. I am honored to support S. 292, the Pledge of Allegiance resolution, and I hope that the rule of law will be upheld by an ultimate rejection of this wrongheaded decision of the Ninth Circuit Court of Appeals. Blech. Reading this again reminds me of the frustration and righteous anger I felt on those lunchbreaks. It’s not very consoling that her remarks aren’t the worst on there. By now it’s likely that Hillary Clinton’s views on this have, shall we say, “evolved,” but she also said last year that “the Bible was and remains the biggest influence on my thinking.” As the 2016 presidential campaigns move forward, I’d be interested to hear more about her views of secular Americans and the often-dangerous entanglements of religion and government.